We’re no longer just happy to be there. Now we’re participating! That’s right, Benchmark Email joins the ranks of Yelp and PayPal as presenters. Get excited, Benchmark Email to Host Seminar at the Small Business Expo. Hal writes his response to Mitch Joel’s article And You Will Know Us By The Trail of Content. Which is appropriate, as I’ve always been intrigued by the namesake band that Joel’s article references. See why You Write Content to Intrigue, Not Inter. Our two favorite Benchmark Email personalities are now coming to you weekly via the radio airwaves. Thanks to the United States-Mexico Chamber of Commerce, we have a weekly radio segment titled Technology Is Your Ally. Be sure to tune in and Listen to Benchmark Email on W690 AM, Thursdays at 8 PM. This seems like a totally legitimate, great idea. However, put in the hands of someone like me it’s going to get flooded with ideas like: give me all the Inspector Gadget toys. See the benefits of PublicScroll: Crowd Sourced Idea Generation for Brands. If you don’t heed these lessons, people will start telling jokes like: the ingredient in their special sauce is bigotry. That’s why you should check out these 3 Lessons Learned from Chick-fil-A’s Marketing Failures. Ask Andy Followup: Your Viewers Are Sharper Than You Think! Nobody is perfect. Not even a cartoon version of yourself that you have total control over. At least we own up to it in this Ask Andy Followup: Your Viewers Are Sharper Than You Think! Do we respect Twitter for it? Find out in our Social Media Reviews: Twitter Respects Do Not Track. It’s almost too bad a startup named their company RebelMouse, because it would be a totally sweet band name. Alas, they got there first. Read RebelMouse: Profile of an Iconic Startup. 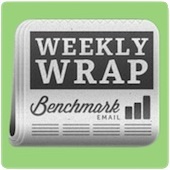 Subscribe to Benchmark Email for a Chance to Win a GoPro HD Hero!